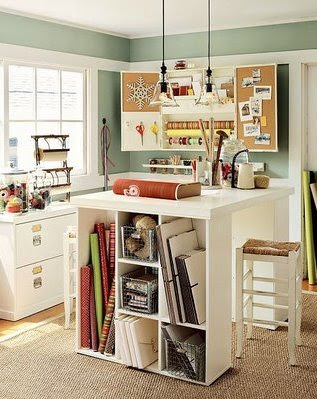 For my dear friends that have been listening to me complain for the past 2-3 years about my unfinished basement...the future location of my craft room/office...this is for you. If I had all the time and money in the world, I would want my creative space to be a happy place like Heather Bailey's...check it out here!! Yes, you'll never believe what I found out yesterday after visiting one of my favorite local scrapbook stores, Heartland. You see I haven't been in a scrapbook store since before Christmas...whether it was from lack of funds or lack of time, I just haven't gone. So after that long of a break from one of my favorite places to blow money, I figured I was in for it...I knew I'd go a little nuts and would have to figure out justify my purchase to my honey. So most of you know that I like to stay up late when the house is quiet and work. Well, it was moments away from my pending birthday (almost midnight) and I wondered up to the kitchen to get me a drink of milk. 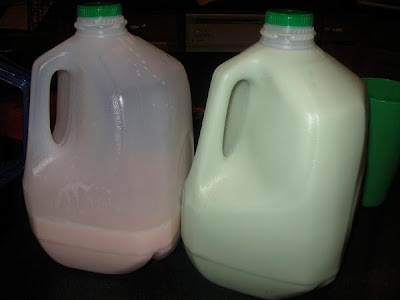 I poured me a cup and thought for a brief moment that the milk seemed a little off color, but then I chalked it up to my tired eyes and maybe a reflection off something in my kitchen. My daughter keeps getting mad at me that I always scrapbook "her" and not her brother. Well I just happens that most of the beautiful scrapbook stuff is so girly AND he's never around for me to shoot any pictures, but she is!! 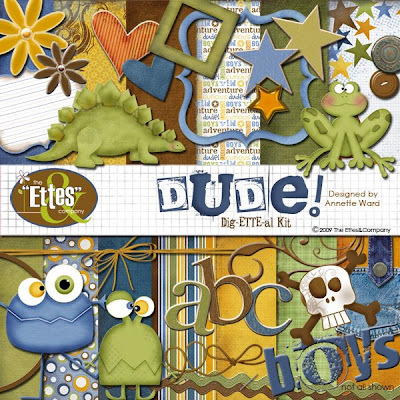 So here are some darling layouts I threw together with the new DUDE Collection from Ettes & Company. Love these designs!! 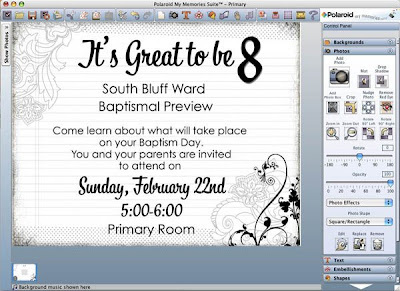 I needed some quick invitations for church last week, so I turned to My Memories Suite. I started by creating a landscape page from scratch. I dropped in a new paper design from the Be My Guest Pack by Ettes & Company and then added ONLY text. It's amazing what you can do with beautiful fonts! 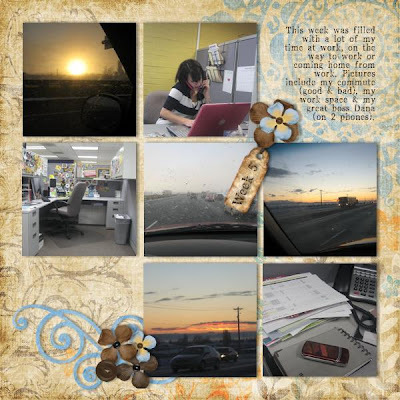 I exported (share button) my page out as a JPG. And then I printed it out on white cardstock. From most PCs you can print 4-up to a page from your preview screen. But I dropped it into Word and pasted a few copies so I had four to a page. I then trimmed them with my paper trimmer. Next I trimmed a slightly larger piece of black cardstock, punched the right edge with my very cool Stampin Up punch and adhered them together. I tied a small piece of ribbon to a paper clip and slid it onto the white part. software, using the Bohemian Designer Pack by Miriam Lima (new pack available online in the Design Shop). The paper was too gorgeous that I didn't want to over embellish the layout. 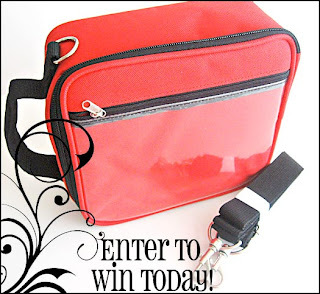 Software using the My Favorites Recipe Designer Pack by Ettes & Company. Love all the veggie art and beautiful word art this set had...to yummy not to use!! 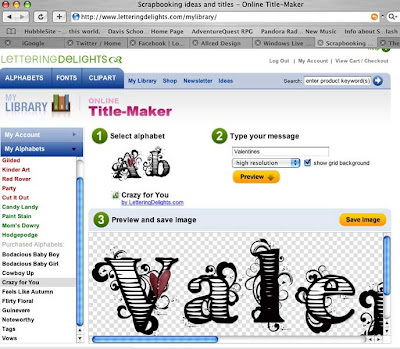 Online Title Maker - Rockin Idea!! Okay girls, how many of you remember using Lettering Delights over the years, a great source for the cutest journalling fonts available? Well I have to admit, it's been a while since I checked out their site and wow was I impressed when I went back recently. But the thing that motivated me to post about this was their new Online Title Maker. You know how we all have tons of PNG alphabets/monograms and they're tedious to use at times? This is the coolest online tool I've used. You can take the alphabets (NOT fonts) you purchased and create your own custom titles in a matter of minutes!! My good friend Wendy pointed me to this find thanks to her Twitter posts. And it's worth passing along to all of you. It's a great find, the new Martha Stewart Button Punch! Not only does it punch, but it also makes an embossed edge! You can pick yours up at Michaels. And did you know you can register online to receive Michaels newsletters and coupons reguarly and then they will send you an email and you can print their coupons out! Donna Downey just posted some of her NEW limited series release of handmade inspiration journals on her website...and they are darling! These journals has been sewn and assembled by Donna herself and measures 7" x 9" each one signature journal is ribbon bound though 3 nickel grommets. 12 full pages and 14 random inclusion pieces to help jump start your creative juices flowing. 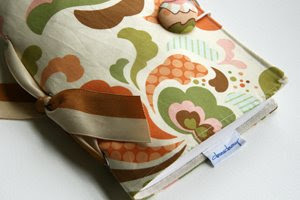 Find out how Donna uses these cute Inspiration Journals here. I get many, many great tips off my friends from Facebook and today was no exception. I was invited to attend "Art Market" in Salt Lake yesterday, but didn't end up going. However, this darling artist was there and thanks to Facebook, I learned about her shop on Etsy and I've already purchased a bunch of her darling headbands. Not bad price either (2 for $20). You can purchase online at Happy Little Artist on Etsy. 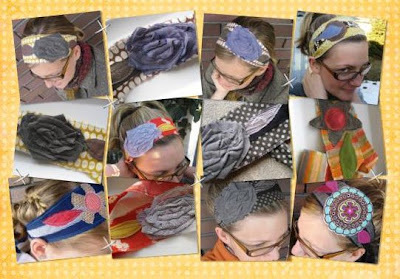 Design Note: I couldn't decide which of her headband pictures to share with you, so I saved a bunch to my computer, threw them into a photo template in My Memories SuiteMy Memories Suite, tossed in a background a few staples and created this for my blog in a matter of minutes. Fun!! My dear friends of Ettes & Company just announced their new Creative Team. And I'm proud to announce that I'm part of this very talented group of ladies. Yes, I know I'm already swamped (who isn't)...but I couldn't resist the opportunity to play with their beautiful designs. And the best part is they're designs are available for regular digi download for photoshop or templates and packs for My Memories Suite by Polaroid program. Here's a layout I threw together last night with their new Mom's Life Collection (combined with Templ-Ette in Photoshop). Too Cute not to Share!! I have some of the most talented and artistic friends around!! They inspire me all the time and I love that they share their talent with me. 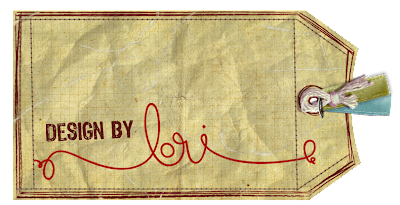 One great example is my darling friend Miriam sent me this cool tag she designed for me to attached to my own creative pieces...how cute is it?? Thanks Miriam you made my entire day! Happy February!! Well they did it again, my favorite digi designers (Ettes & Company) have created some of the cutest Valentines ever! 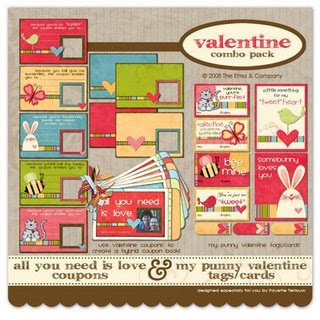 These very inexpensive digi sets have treat bag toppers, Valentine cards, tags and a very cute Valentine Coupon book. 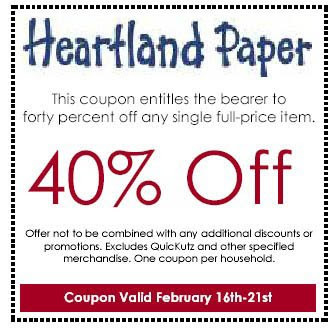 Visit their blog to download your free coupon book idea sheet (too cute). Check out what I did with these designs below! Here's the fun treat bags and tags my daughter and I created this weekend using these dang cute ideas. It was super easy and fast and I'm never buying another overpriced Valentine card set again. RealRach, please contact me at lori@lilredcottage.com with your shipping information and I'll get this sent out to you soon! !